Waterfront on Fresh Water near Acadia National Park & Bar Harbor - Kayaks Too! Pine Bluff accommodates up to eight guests in 3 bedrooms + 2 baths. The second floor bedroom has a king and a trundle, twin under a twin. The first floor bedrooms have a queen bed and 2 twins. There are 2 baths, one with a tub/shower combination and washer + dryer. The other has a shower. Updated modern kitchen with large island in the large open living area. Beautiful stone hearth with Franklin Fireplace compliments the open area with cathedral ceilings. Newly installed heat pump system offers both heat and cooling for the hot summer nights. Tranquil pond views through the sliding glass doors that run the front of the living area onto the large deck. At the water's edge there are kayaks, canoes + row boat for your use. There is a hammock and deck furniture for relaxing and the hustle and bustle of Bar Harbor is just 20 minutes away. There are other cottages available if you are traveling with more than 8 guests. Acadia owns the entire eastern side of Hodgdon Pond. Swimmers enjoy the pond June through Sept. The recreational, cultural, and dining offerings in this area are phenomenal. Acadia National Park is at your fingertips. and there is a FREE bus transportation system! The second floor bath has a shower stall and the first floor bath has a tub/shower combination. Newly renovated with center island. Pine Bluff is one of several vacation rentals on the quiet side of MDI where we have stayed, but it is the only home we plan to rent again. The location, amenities, pets allowed, value, were perfect. Thoroughly enjoyed our vacation to MDI this year and cannot wait for 2019 to visit again and stay in this perfect cabin! It is a very cozy, clean and beautiful property by the pond. Its a short drive to Acadia and Bar Harbor downtown. We had a great time hiking in Acadia, cooking and boating while we were there. I would definitely recommend it to others. The first time we laid eyes on our cottage and the magnificent surroundings all we could do was stand there with our mouths open. Absolutely breathtaking. That was back in the 1990's. We came back 4 years in a row to Rockpoint at Hodgon Pond. Due to life, we couldn't go back for a while, but this year we made it a point to celebrate our anniversary where our hearts yearned to return. We weren't disappointed. We stayed at Ann's Point Cottages on Southwest Harbor. Margo Stanley is a very kind and gracious host. Our cottage was immaculate, comfortable,and we lacked nothing. No matter what you do or where you go in the area it's all good. If you love the ocean, forests and hiking this is the place for you. If you love small villages with friendly people, this place is for you. If you want to get away to do nothing and escape the hustle and bustle of life, this place is for you. We highly recommend any cottage that the Stanley's own. Every one is strategically located for privacy and beauty. One of us has the habit of crying on the day of departure every time. We plan on returning,if possible, every year. Our family has been staying at Pine Bluff at Hodgdon Pond for the past 8 years and our vacations in Maine have become a much beloved family tradition. Our kids, now 19 and 23, consider it their home away from home. The house is large, clean, well maintained, and comfortable with a fully equipped kitchen, flat screen TV, and plenty of bedrooms. If there was ever any problem, Margo responded quickly to take care it. We spent many contented rainy days reading and playing board games and watching movies in the living room. And when the weather was good, we'd spend days kayaking (Margo has plenty of canoes and kayaks) and swimming on the beautiful, serene pond. 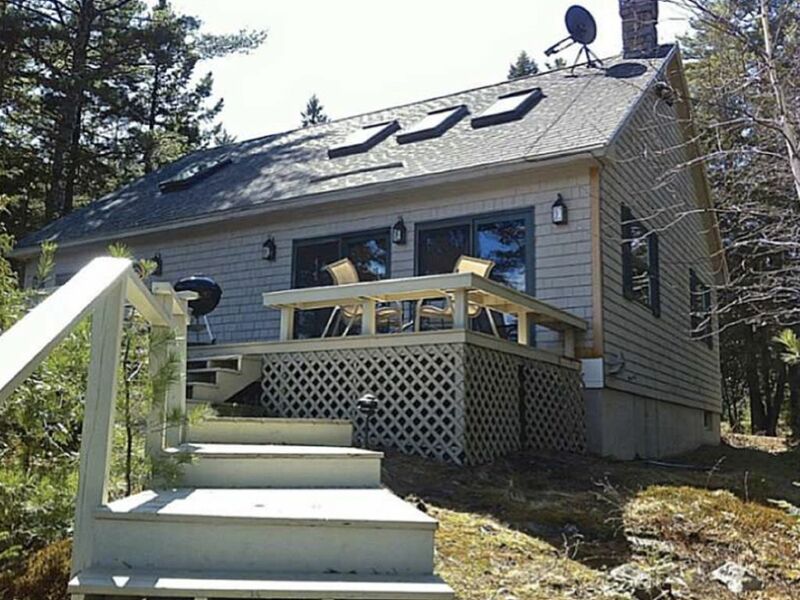 We love being on the Quiet side of the island and being so close to Southwest Harbor with its library and great restaurants and little shops as well as close to all the great hiking in Acadia. In fact, we talked about loving Pine Bluff so much that our closest friends decided to give it a try and have now made it their annual family ritual! Thanks Sharon. Coming back for 8 years is a great review all by itself. We want to know if something is not right so we can fix it and always welcome your call. This was our 4th visit to the Boathouse. Though small, it suits our needs (2 adults) well. Best part are the kayaks and canoe.... loons on the pond, in a canoe on a moonlit night... just steps from your door...perfect. Cancellation Policy: Refunds will be made for monies paid toward your reservation, minus a $200 cancellation fee only if the owner is able to re-rent the property . We highly recommend exploring travel insurance options for peace of mind and protection in the unforeseen event you have to alter your vacation travel plans.